Remember, I said "rough" so all those jaggies will be filed nice and smooth in the final inlay. OOOOH . . . UHHHH . . . OOHHHHH . . . . !!!!!!! More later . . . after I regain my composure. Okay - I believe I can type in complete and coherent sentences again. Susan and Mica - I think the guitar looks absolutely beautiful! The coco bolo exceeds my expectations and the vermilion lam really helps to bring out the orange in the top. 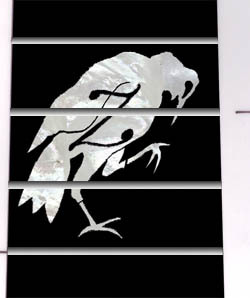 Susan, the inlay art is right on. I love the movement and grace in the piece. - By the way, I hope I didn't sound like a raving lunatic on the phone earlier, but I had "kind of" managed to put the Skylark in the back of my mind and, upon seeing the pictures, I got rather excited in anticipation of seeing her in person. Thanks much for the pix. My favorite wood recipe (vermillion body/coco bolo top), the maple accent looks great too, so that's something I'm also sure about now. And that inlay! Wow, just my taste, and tastefully done it will be, if that's only the mock up. Tom, congratulations with such a fabulous piece of art! Damn, that was fast! Mica and co are in overdrive (ludicrous speed? LOL!). I didn't even realize that was your guitar until I saw your posts. It looks awesome! It won't be long now, Bro. Thanks Wilfred - actually the body is mahogany and the top is a three-piece sandwich with vermilion, maple and coco bolo. I'm very pleased with the appearance and the tone should be beautiful. The inlay is a small tribute to a great dog that we once had. She was a Chesapeake Bay retriever (very similar in color to coco bolo), named Crow, and was the subject of paintings and poetry. 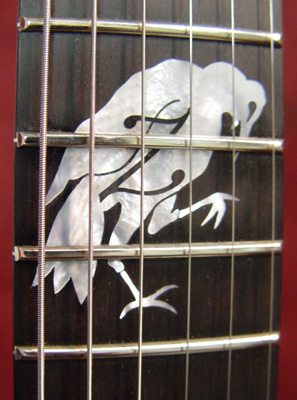 The crow that Susan created for the inlay was the result of only a conversation and a couple of emails, and she was able to capture exactly the spirit that I hoped for in the piece. Kevin, I've been impressed with how smoothly the whole project has unfolded and I'm really excited in anticipation of the "Crow" flying home. 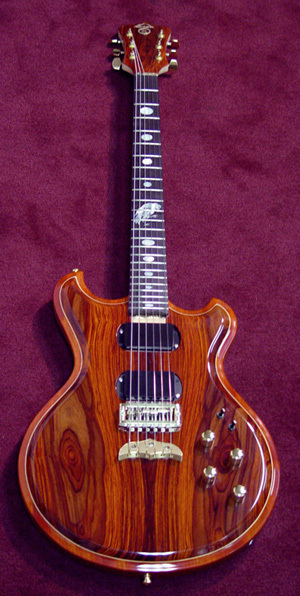 =) I love the Skylark body style, which I understand is primarily a design of Mica's and can't wait to hear those sweet Alembic tones ringing in my world. Looking at the picture more closely made me realise that there's mahogany in the back(ground) indeed! Hippy sandwich anyone? The contrast between the coco bolo and vermillion is just stunning, I've been looking at this picture again and again since it was posted. I'll definitely go for that combination with my future custom! Well I wouldn't say we were in overdrive but the design was thought out, discussed & decided.Then we were set free to contruct with no further changes. Changes and redesigns always slow down the process. You have to be doublely careful before proceeding making sure everyone is on the same page. The estimated time of construction clock doesn't start tickin until the last change is made. This guitar went through the process like butta! "Like butta?" I knew you had a little Jewish mother in you, Susan! I got a chance to see your guitar today and was blown away with how it looks. I am sure you will be very happy with the results. Nice Guitar! Rory - Thanks for posting your thoughts after seeing our instruments in person. I realize that photographs pale in comparison to actually seeing one of these beautiful guitars, but I am thrilled nonetheless every time I see the photos above. It's great to hear how nice it looks from someone that's seen it up close and personal. I understand we'll be shipping on Monday, so you'll be letting us all know later in the week how you love it! I didn't notice the Z in the crow until now - very clever. Tom: Very nice! This one could be an Alembic World Record for speedy completion. The moral of the story is: Know what you want AHEAD of time, don't make any changes during fabrication, then you get your masterpiece in no time flat! Mica - thank you for the wonderful preview. I'm sure I'll visit this page often in the next few days while waiting for this exquisite guitar to arrive at home. Thanks for the compliments folks - I'm very excited with anticipation. When I'm able to take a break from playing this beauty, I'll post a few more photos in the showcase. WOW! That's got to be the nicest looking Skylark I've seen yet. 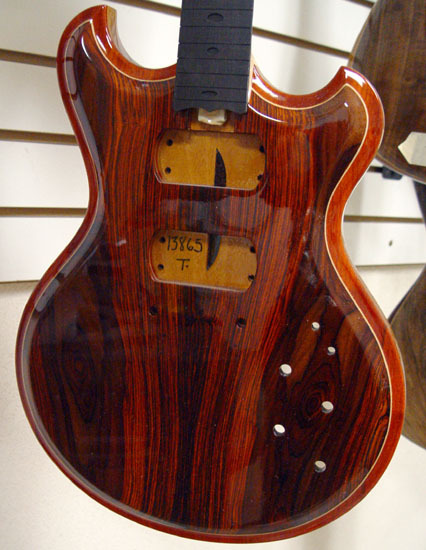 The cocobolo top is amazing. ENJOY! just to sing his blues.